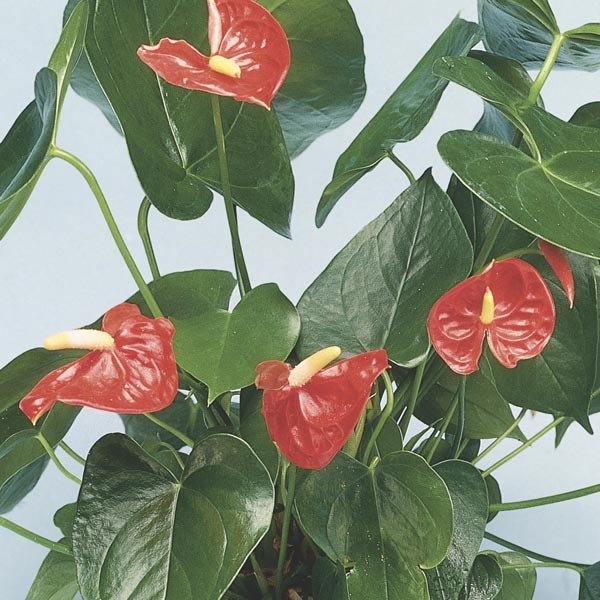 Easily identified by its unique flower structure, this is a plant that adds an instant touch of the exotic to any location. The colorful, leaf-like structure, called a “spathe” is often confused for the flower. The spathe is actually a modified leaf attached to the narrow spike that produces the tiny real flowers. Anthurium enjoys warm temperatures and grows best in a bright indoor location or partly-shaded location outdoors during warm months. Perfect for all kinds of containers. Very decorative on a small table or in a hanging basket. Water thoroughly but allow soil to dry slightly between waterings. Apply a balanced liquid fertilizer monthly during active growth.